Home > Wolfgang Product Line > Wolfgang Duo 3.0, 16 oz. Correct paint problems both big and small with the Wolfgang Duo! Wolfgang Total Swirl Remover 3.0 and Wolfgang Finishing Glaze 3.0 eliminate restore all types of automotive paint in just two steps. This kit includes Lake Country's CCS Dual Action 5.5 inch Smart Pads™ Foam Pads. These flat full contact buffing pads work with your dual action polisher to correct automotive paint more easily than ever before. The CCS Smart Pads™' user-friendly features provide better control, less product waste, and a more successful detail. 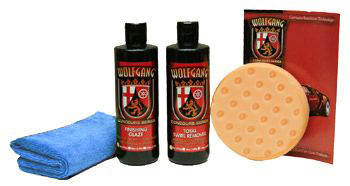 Wolfgang Total Swirl Remover 3.0 and Wolfgang Finishing Glaze 3.0 are both made through the combined effort of Wolfgang and one of Germany's most well-known and respected manufacturers of car polishes. Each formula utilizes Wolfgang diminishing abrasive technology and a proprietary milling process pioneered in Germany. The results are two professional grade car polishes that will remove a wide range of imperfections and restore a showroom shine to your vehicle. First, remove moderate imperfections with Wolfgang Total Swirl Remover3.0 and a light cutting pad. Then follow up with Wolfgang Finishing Glaze 3.0 and a white pad to smooth away haze and restore surface gloss. These two products are made to work hand in hand to give your vehicle a smooth, flawless shine in just two steps! 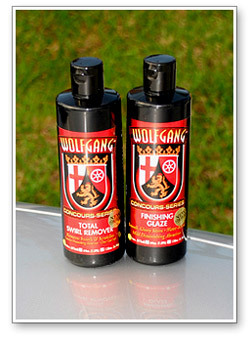 The Wolfgang Duo is an excellent opportunity to try Wolfgang's premium swirl remover and finishing polish. Both products are formulated to deliver exceptional results when applied with your Porter Cable 7424 dual action polisher. Take advantage of this great offer! Receive this 4 piece kit for even less than the price of the two polishes. Consider the towel and 5.5 inch pad our gift for trying Wolfgang's ultimate swirl removing duo! Wolfgang Total Swirl Remover 3.0 is a hybrid of our original Total Swirl Remover formula and Germany's fast-cutting polish for ceramic clear coats. It combines Wolfgang's diminishing abrasive technology with a special milling process pioneered in Germany, which produces consistently sized, fast cutting abrasives. Wolfgang Total Swirl Remover 3.0 is an aggressive swirl remover with the gentle touch of a shine-enhancing polish. It's not an oxymoron – it's a unique breed of abrasives that level paint without scratching. Wolfgang Total Swirl Remover 3.0 starts improving the paint immediately and leaves the paint noticeably smoother and shinier, even before the finishing polish is applied. The orange pad is designed for light to moderate swirl removal. The small size enables you to apply extra pressure where you need it. The CCS 5.5 inch Orange Pad is the same density as our CCS 5.5 inch foam pads. Use it with Wolfgang Total Swirl Remover 3.0 on your D.A. polisher with a 5 inch backing plate. Use this microfiber cloth for drying, buffing, or as a finishing wipe down. Microfiber is designed to be light, strong, super-absorbent and quick drying. The fibers are non-abrasive, and are woven so tightly that it's absolutely lint free and extremely durable. Unbelievably, these ultra-tough fibers are engineered to absorb seven times their weight in moisture. Use the Cobra Cobra Microfiber Towel to safely buff the paint after polishing.